Locked out? Don’t call your emergency services, call a local locksmith! Locked out of your home? Who would you call your local fire brigade or your local locksmith? 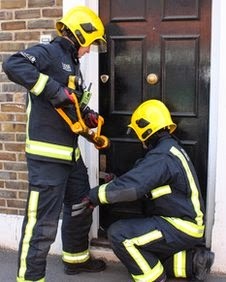 The London Fire Brigade reported that from 2009 – 2012 they had been called out to nearly 22,000 incidents (approximately 20 a day) which would have required a locksmith. These incidents ranged from people trapped in cemeteries to people trapped in toilets. These call outs are estimated to cost taxpayers more than 5 million. Fire brigades and other emergency services across the UK are looking to reduce these types of callouts; the majority of emergency services have advised an emergency locksmith should be called to these types of incidents unless someone’s life is at risk. So if you find yourself locked out of your home or locked in please remember to call your local locksmith rather than the emergency services! We highly recommend saving the number of your local locksmith into your mobile phone in preparation should the worse happen. Find your nearest locksmith’s number by visiting keytek.co.uk and entering your town or postcode in the search bar and click find. Usually a local locksmith will be able to get to a property in response to an emergency situation such as being locked out within an hour. The majority of locksmiths will also put you at ease by offering to give a courtesy ten minute warning call. Does the locksmith carry any form of ID? Are they DBS checked (formally CRB)? Have they been assessed and accredited by industry experts? Does the locksmith have any form of accreditation? Do any parts that are replaced come with a guarantee? Do parts supplied by the locksmith meet your home insurance provider’s requirements?